Maple syrup urine disease is a rare inborn error of amino acid metabolism involving catabolic pathway of the branched-chain amino acids. This disease, if left untreated, may cause damage to the brain and may even cause death. These patients typically present with distinctive maple syrup odour of sweat and urine. Patients typically present with skin and urine smelling like maple syrup. Here we describe a case with relevant magnetic resonance imaging findings and confirmatory biochemical findings. Maple syrup urine disease (MSUD) is a metabolic error involving catabolic pathway of the branched-chain amino acids leading to build up of ketoacids, which give rise to the classic 'maple syrup' or burnt sugar smell. MSUD affects an estimated 1 in 185,000 infants worldwide. The most common and severe form of the disease is the classic type, which becomes apparent soon after birth. Beginning in early infancy, this condition is characterized by poor feeding, vomiting, lethargy and developmental delay. If untreated, MSUD can lead to seizures, coma, and death. Here we describe the Magnetic resonance imaging (MRI) findings in classic type of MSUD, which presented without the classic maple syrup smell. A 11-day-old male baby, born of primigravida mother of Indian origin through second degree consanguineous marriage was well for 2 days after birth and then developed marked lethargy, progressing to seizures and coma. Antenatal period was uneventful with a normal vaginal delivery. There was no history of birth asphyxia. At presentation to the hospital baby was unresponsive to pain except for tonic movements of upper limbs. Markedly boggy anterior fontanelle, usually seen in MSUD, prompted a referral for MRI, though urine and skin showed no typical smell of maple syrup. Cerebrospinal fluid (CSF) analysis was normal. 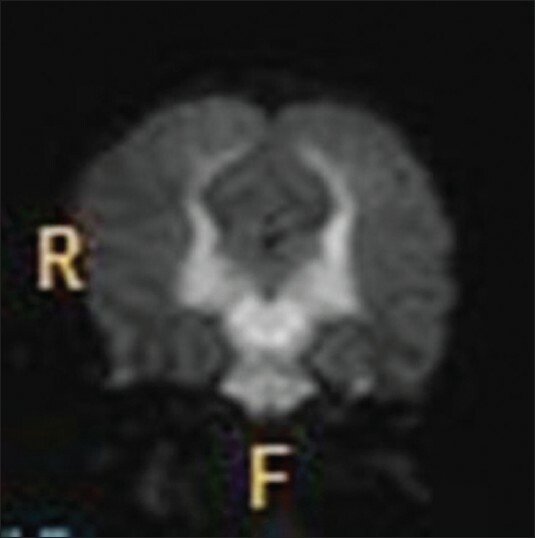 MRI showed diffuse restricted diffusion involving bilateral cerebellar white matter, entire brain stem, bilateral thalami, internal capsules and corticospinal tracts [Figure 1], [Figure 2] and [Figure 3]. Subtle T2 FLAIR (Fluid Attenuation And Inversion Recovery) hyperintensity is seen in the above regions [Figure 4]. Aminoaciduria was suggested as the possible diagnosis with a suggestion to rule out MSUD. Tandem mass spectroscopy showed increased levels of leucine and isoleucine (=1787 nmol/ml; ref < 350) but normal valine. Urine gas chromatography-mass spectrometry (GC-MS) confirmed MSUD. 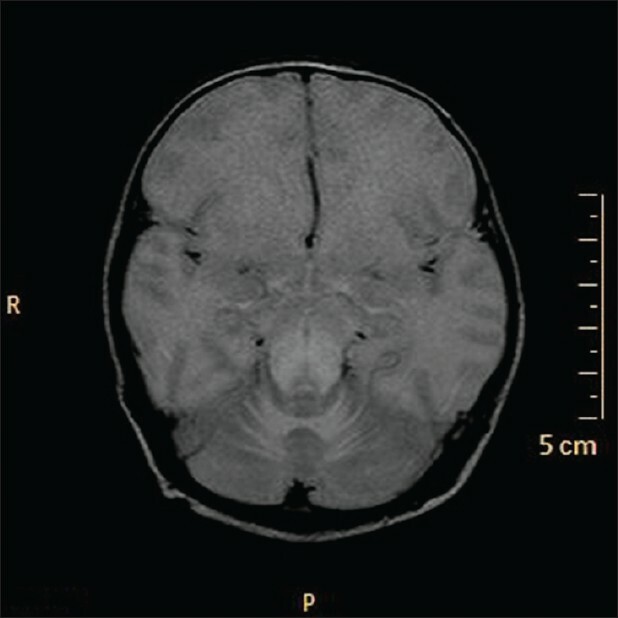 The patient was treated with dietary modification and measures to reduce cerebral edema. Unfortunately, the baby expired on day 15 of life, without responding to treatment. Diffusion-weighted magnetic resonance (MR) has an important role in the assessment of brain maturation and of white matter diseases in the fetus, neonate and the child. Diffusion MR imaging enables a better characterization of the lesions demonstrated by conventional MR imaging, for instance, in the hypoxic-ischemic encephalopathy, in infections and in the inherited metabolic diseases, and is particularly important for the longitudinal evaluation of these conditions. The areas of restricted diffusion represent cytotoxic edema and damaged oligodendro-axonal units within the affected white matter. Generalized diffuse edema, though not characteristic is known to occur in MSUD with localized, more severe edema involving the deep cerebellar white matter, the dorsal part of the brainstem, the cerebral peduncles, and the dorsal limb of the internal capsule. , Our patient showed diffuse restricted diffusion involving bilateral cerebellar white matter, entire brain stem, bilateral thalami, internal capsules and corticospinal tracts. Presence of such finding points towards aminoacidurias, including MSUD, in spite of the absence of maple syrup odor. Differential diagnoses for similar pattern of restricted diffusion include nonketotic hyperglycinemia and Canavan disease. Lab investigations (tandem mass spectroscopy for blood levels of amino acids and Urine GC-MS for urine levels of amino acids) are confirmatory for the underlying disease. Though MSUD is life threatening as in our case, earlier and prompt treatment of MSUD would help reverse the decompensated state and prevent associated mortality and brain damage in surviving patients. Follow-up MRI can reflect the reversal of findings in appropriately treated cases. Prompt recognition of the pattern of diffuse restricted diffusion involving bilateral cerebellar white matter, entire brain stem, bilateral thalami, internal capsules and corticospinal tracts and raising the suspicion of aminoacidurias, is essential in curtailing the morbidity and mortality of the affected patients. 1. Naughten ER, Jenkins J, Francis DE, Leonard JV. Outcome of maple syrup urine disease. Arch Dis Child 1982;57:918-21. 2. Mascalchi M, Filippi M, Floris R, Fonda C, Gasparotti R, Villari N. Diffusion-weighted MR of the brain: Methodology and clinical application. Radiol Med 2005;109:155-97. 3. Parmar H, Sitoh YY, Ho L. Maple syrup urine disease: Diffusion-weighted and diffusion-tensor magnetic resonance imaging findings. J Comput Assist Tomogr 2004;28:93-7. 4. Brismar J, Aqeel A, Brismar G, Coates R, Gascon G, Ozand P. Maple syrup urine disease: Findings on CT and MR scans of the brain in 10 infants. AJNR Am J Neuroradiol 1990;11:1219-28. 5. Jan W, Zimmerman RA, Wang ZJ, Berry GT, Kaplan PB, Kaye EM. MR diffusion imaging and MR spectroscopy of maple syrup urine disease during acute metabolic decompensation. Neuroradiology 2003;45:393-9. 6. Bindu PS, Kovoor JM, Christopher R. Teaching neuro images: MRI in maple syrup urine disease. Neurology 2010;74:e12. 7. Sener RN. Maple syrup urine disease: Diffusion MRI, and proton MR spectroscopy findings. Comput Med Imaging Graph 2007;31:106-10.